When Samsung launched the very first Galaxy Note at IFA 2011, the device -- a 5.3-inch behemoth that came with a stylus - seemed absurdly large. But the idea was crazy enough to work: It was the beginning of a brand-new phone genre adopted by nearly every handset maker around the world and beloved by millions. Three years later, we're being introduced to the fourth smartphone in the series, known as the Galaxy Note 4. As you might expect, the device comes with new and improved specs in both hardware and software, but the design of the 5.7-inch phone itself has made a huge step in the right direction: It comes with an aluminum frame, and based on my first impression, it's the best looking of the bunch. It's time to explore Samsung's latest large-screened device. When it comes to design language, Samsung likes to be consistent across most of the devices in its repertoire. Often, it'll choose a specific style and use that in multiple devices over the course of several months (last year's faux leather and skeuomorphic stitching; the "inspired by nature" design of two years ago) before changing its focus. Starting with the Galaxy Alpha and now continuing on with the Note 4, it appears that Samsung recently began a new and improved style that features aluminum sides, chamfered edges and the company's signature "leather-like" back. Yes, the Note 4's frame is made of actual, honest-to-goodness aluminum, not the usual faux-chrome plastic that's supposed to look like it's metal (but ends up appearing a bit cheap in the end). It's something I've hounded Samsung about for years, and I'll give the company credit for finally finding a way to make it work. 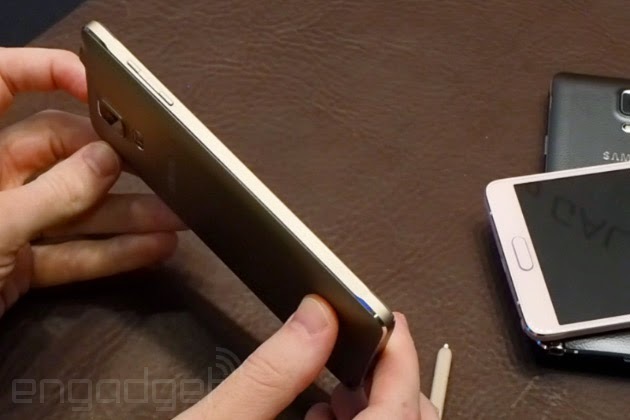 The Note 4 looks -- and feels -- like an elegant, premium phone as a result. I shouldn't sing so much praise over just one aspect of the phone's design. After all, it's entirely possible to make a phone with metal sides look ugly and/or cheap, right? Fortunately, Samsung kept that in mind, because in my first impressions, it's hard to find fault with any aspect of the Note 4's hardware. The sides use chamfered edges to meet the front and back (similar to the iPhone 5s or HTC One M7); the removable back is still made of the same "leather-like" polycarbonate build as the last Note, but Samsung got rid of the distracting stitches that went around the perimeter of the phone. The glass is 2.5D, which means it's not entirely flat -- like many Nokia Lumias (and even the Galaxy S3), there's a very subtle bend along the edges of the screen. Compared to the previous model, the Note 4 uses the same screen size and is about as thin (8.3mm), but it's 2.3mm taller, 0.6mm wider and eight grams heavier. It seems odd because the first two Note sequels were smaller than their predecessors, despite coming with a larger display. I don't think Samsung needed to make the screen any larger this time, as it's done in the past, but I would've preferred to see the chassis trimmed down, at least. That said, this additional width may simply be taking into account the fact that the sides bulge out slightly at the top and bottom, because I didn't immediately feel any noticeable difference in comfort level. Just as you'd expect in any incremental device in a given phone series, the new phone comes with plenty of improvements over the last. The Super AMOLED screen got a bump from 1080p resolution to Quad HD (2,560 x 1,440); the rear-facing camera is now 16MP (up from 13); and the battery gets a marginal increase from 3,200mAh to 3,220mAh. The Note 4 also marks the first time in a long time that Samsung has improved the front-facing camera: It's blessed with a 3.7MP sensor and an aperture of f/1.9 for theoretically better low-light selfies. The Korean Note 4 will feature an octa-core Exynos 5433 chipset, which is split up into a 1.9GHz quad-core processor for bigger activities and a 1.3GHz quad-core for the menial tasks; everywhere else, the Note 4 will boast a 2.7GHz quad-core Snapdragon 805 with a 600MHz Adreno 420 GPU. Both versions will feature 3GB of RAM, the same amount as the Note 3. For internal memory, you can choose between 32 and 64GB, and you can add up to a 64GB microSD card (not 128GB, oddly). Lastly, just like the Galaxy S5, you'll get a fingerprint scanner on the front and a heart rate monitor on the back underneath the camera and next to the flash; Samsung's added a UV light sensor to the back as well. If you recall, the Note 3 came with an unsightly USB 3.0 connector port, which Samsung added for the sake of faster data speeds. This year, the phone maker went back to USB 2.0; the product managers said that not many people were using the 3.0 port for data transfers, so they didn't see the point in taking up room inside the phone for that purpose. The charger at least comes with fast-charging capability and the phone maker claims that the battery will charge 30 percent faster when you use the charger that comes in the box. I clarified with Samsung that it chose a proprietary solution instead of licensing Qualcomm's QuickCharge tech, but it insisted that you could still use QuickCharge 2.0-compatible chargers to achieve the same results. As I mentioned earlier, the front-facing camera is supposed to be better in low-light scenarios, thanks to its f/1.9 aperture, and Samsung has added a "Smart Optical Image Stabilization" feature to the rear camera to minimize shaking and allow more light in dark situations. It feels as though there's more of a focus on the front cam, however, since so much attention is being put on the selfie experience; on the Note 4, it comes with a 90-degree shooting angle by default that can be extended to 120 degrees through a special "wide selfie" mode that takes three photos and stitches them together -- just like a panorama shot. The Note also comes equipped with three mics to help with directional noise cancellation. This has been featured on other phones (some devices even have four mics, in fact), but Samsung has given the device the ability to automatically adjust the recording volume depending on how much noise is around you; the voice recorder also comes with the opportunity to tag and select up to eight directions you want to pick up voices from -- if you only want to pick up the interviewer's voice, for instance, you can do so. 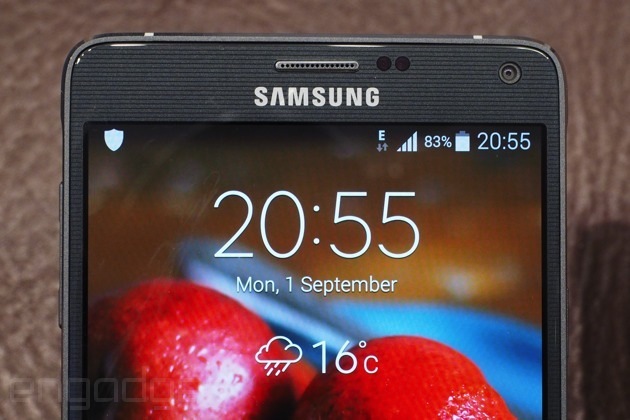 The Note 4 uses Android 4.4 KitKat and keeps to the same overall UI as the Galaxy S5. But since this is a Note product, there are plenty of enhancements to the S Pen experience, both in hardware and software. 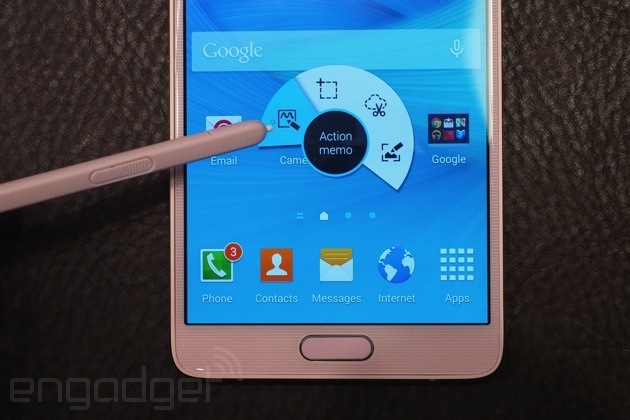 First, Samsung has doubled the pen's pressure sensitivity. It was already pretty good, but making it even more sensitive allows the pen to detect when you're drawing and writing at an angle, so you can have the same experience as a regular pen. As a bonus, there's also a new pen mode specifically for calligraphy that takes advantage of the extra sensitivity as well; Samsung reps were proud of the fact that all of the lines still look incredibly smooth when you zoom in on them. As for software improvements, there are a few features worth pointing out. Snap Note is the most impressive: You can take a picture of any analog note (a regular notepad, signs, pieces of paper) and within a couple minutes, the Note 4 can convert it into digital, which means you can erase and edit that information to your heart's content. There's also a new Smart Select mode, which lets you select multiple images in a gallery with your pen, or multiple lines of text without having to long-press the screen and highlight it manually. Samsung's added a new way to float apps and web pages by dragging your finger toward the center of the screen from the top-right corner; you can then resize the app, as well as minimize or maximize it. You can even convert it into a multi-window screen by dragging it to the top or bottom of the display. Samsung says the Note 4 will be available starting in October and will come in four color options: white, black, gold and pink. Some of the colors, like black and gold, feature different color accents on the metal sides, which go well with the rest of the device. No price has been set yet, but this will largely depend on the region and carrier; I'd expect the price to remain about the same as last year's Note. (The Note Edge, which I discuss here, will come out later in the fall and at a higher cost.) I'm excited to spend more time with the phone as we get closer to launch. 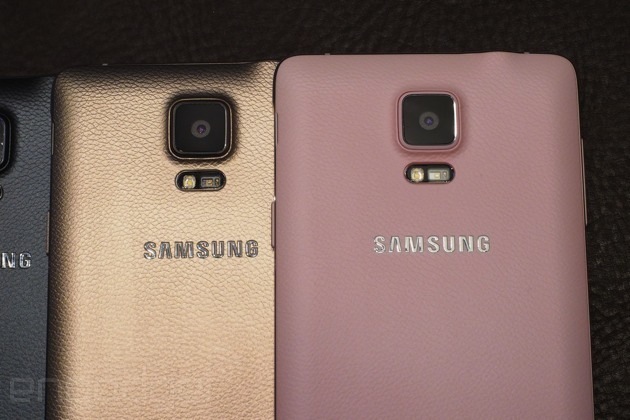 Update: AT&T, T-Mobile, Verizon, Sprint and US Cellular have all confirmed that they'll carry the Note 4 when it launches.